3 nice grass carp out this week for Ian and Jon on swim 11, a 33lb and a 35lb as well as 2 36lb mirrors to give them news PBs. All in all 16 fish between them on a mixture of Mainline Cell and MTC garlic boilies. The catch reports are incomplete this week as there are some missing. A difficult week's fishing this week, the guys really had to work hard with very little reward. Swim 11 did well though for Wout and Jonas with 16 fish to 51lb 8oz. The fishing remains tricky with the fish very inactive generally. But some nice fish out for Peter on swim 11 who managed 17 fish to 49lb on squid and scopex boilies. 4 fish for the chalet swim, Kristof and Michael to 33lb on a mixture of fruity boilies. The biggest fish this week came from the chalet swim (though no photos, sorry) they landed 5 fish including 32lb, 34lb, 39lb, 43lb and 48lb 6oz, all on scopex boilies. Steve on swim 11 landed 9 fish to 38lb, again no photos. Only 4 anglers this week on the chalet and swim 10 and a total of 12 fish between them. Martin and David on 10 had 9 fish to 54lb including a nice grass carp and a 44lb mirror. Remco and Robert on the chalet swim had 3 fish, a 29lb, 35lb and 41lb. Tigernuts over a bed of boilies did the business this week for Philippe and Margot on swim 11. He had 10 fish to 41lb whilst the Schouten family in the chalet had 6 runs and 3 fish, also on tigernuts, to 35lb. It was our turn for a PB this week, 19 people at the BBQ on Wednesday. Lovely to see so many regular guests alongside some newbies so it was a lovely evening. More importantly some stunning fish out and some new PBs for the anglers, namely Klaus on swim 4 with a 42lb, 1 of 3 fish for him the other 2 a 31lb and a 30lb all on tigernuts again. 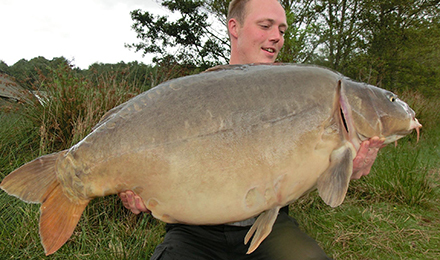 Brad on swim 1 has a new PB with a 32lb mirror he landed also on tigernuts. Stefan on swim 8 landed not 1 but 2 mirrors at 51lb to give him a new PB, and a total of 21 fish including a 46lb and 5 over 30lb. 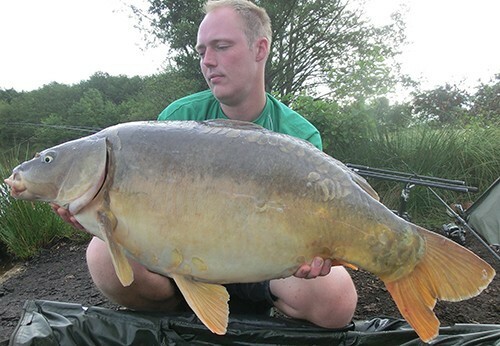 Also on swim 8 Thomas landed 20 fish, also on tigernuts, including 9 over 30lb, 2 at 43lb, and a 49lb 8oz. Andre and Hendrik on 6 and 7 had 15 fish between them including 8 over 30lb, 4 over 40lb to 45lb. Jonas and Marvin on swim 10 had a perfect leather carp at 34lb, (waiting for the photos to come back though) amongst their 9 fish and the Lebherz family on 11 landed 11 fish to 36lb. So a great week with 81 carp and an overall average of 30lb 14oz.